Wellden Turnbull's blog offers expert advice and tips on how to improve the performance and profitability of your business. There's a wealth of information for start-ups and SME's, as well as established corporates, on a whole range of business accounting, tax and legislative issues. It's business made easy and a useful resource for anyone serious about keeping their business on track. 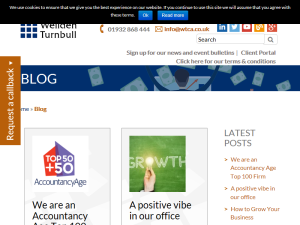 This what your Wellden Turnbull Chartered Accountant Blog Blog Ad will look like to visitors! Of course you will want to use keywords and ad targeting to get the most out of your ad campaign! So purchase an ad space today before there all gone! If you are the owner of Wellden Turnbull Chartered Accountant Blog, or someone who enjoys this blog why not upgrade it to a Featured Listing or Permanent Listing?